Plans for the The Duchess of Cambridge’s ‘Back to Nature’ garden that will be showcased at the Chelsea Flower Show were unveiled over the weekend. 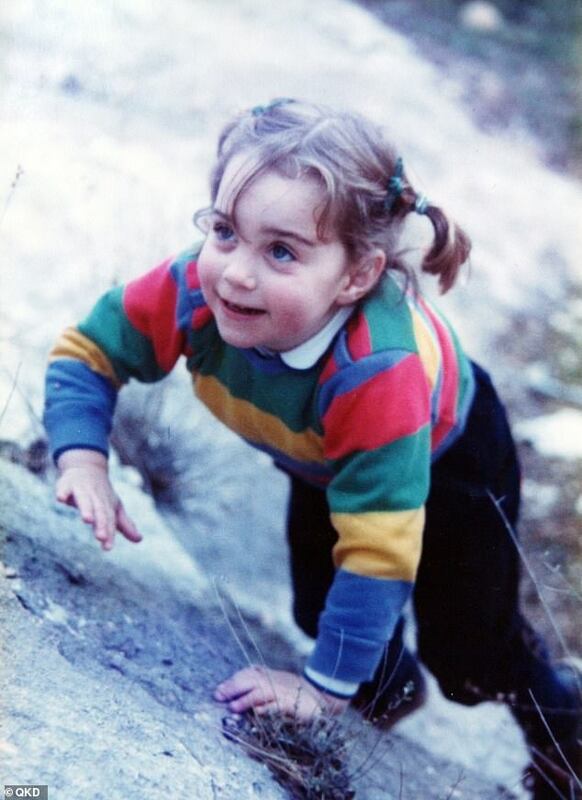 And Kensington Palace has now shared snaps of green-fingered Kate hard at work during the landscaping process of the creation. The two new photographs of the 37-year-old which were shared on Twitter, see the Duchess working alongside Andrée Davies and Adam White while finalising the design. 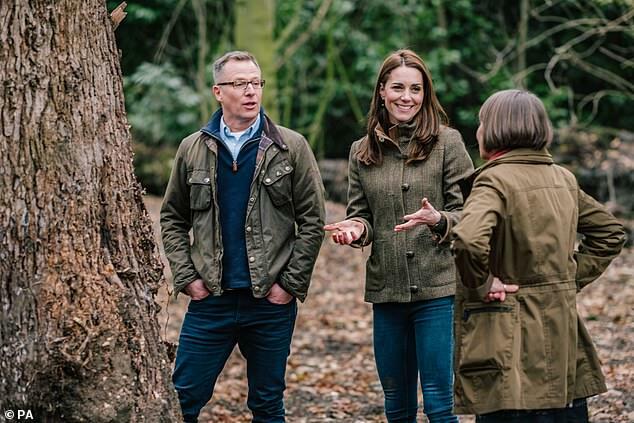 In the first photo Kate is joined by the two landscape architects, in her home of Kensington Palace where they appear to be working on a 3D model of the garden. The royal mother-of-three cuts a casual figure dressed in a rust coloured jumper, £79.50 from J Crew. 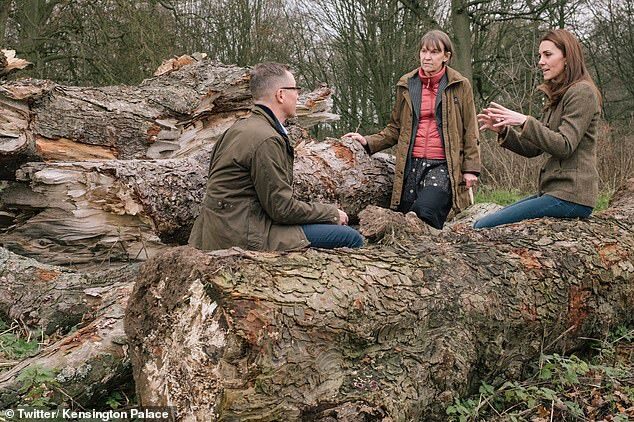 Kate appears to be enjoying a cup of tea as she and her design team talk over the final designs for the garden which is inspired by her own childhood memories. A second photo sees the trio head outside with the two architects taking a seat on the log while the Duchess appears to present her ideas. 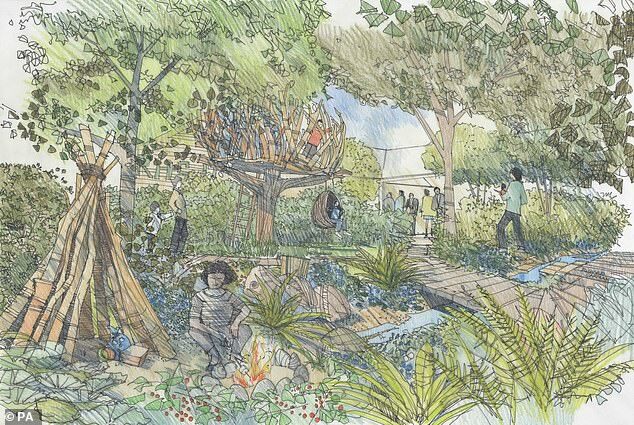 Drawings for the garden were released over the weekend, showcasing the fun-filled haven including a den, a treehouse and a swing. Every feature has its purpose: tree stumps, stepping stones and a hollow log will hone children’s balance, strength and co-ordination, while forest scents and edible fruit and veg plants will engage the senses. Inspired by a bird’s nest, the treehouse is clad in stag horn oak. A sense of adventure is also evoked by a campfire. A waterfall and stream ‘provide another sensory opportunity, for children to paddle in and play imaginatively’. 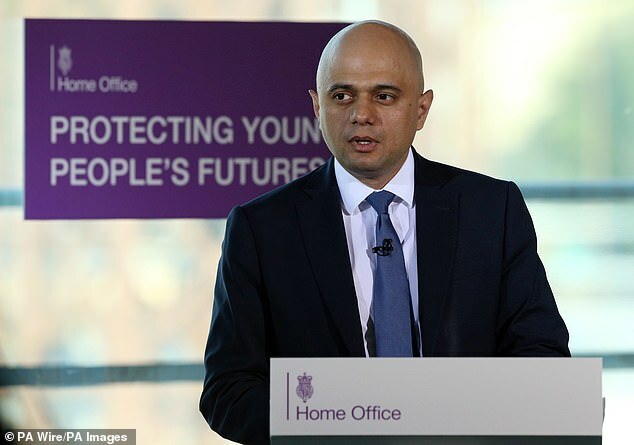 Last week, at an engagement to mark Children’s Mental Health Week, Kate spoke of her children – George, five, Charlotte, three, and baby Louis – enjoying the outside world. Much of the exhibit will be donated to a mental health trust after the show.